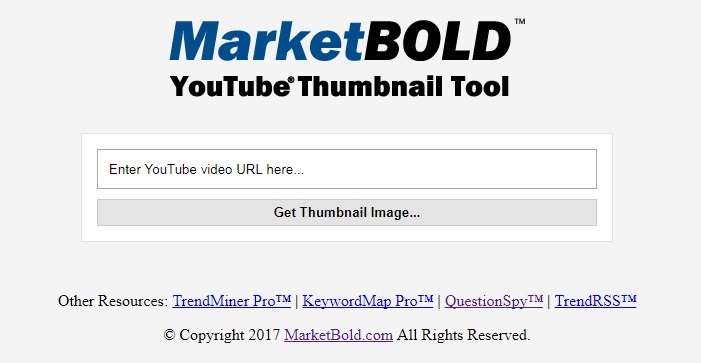 If you’ve ever needed to download and save a copy of a YouTube video thumbnail, or you wanted to get YouTube thumbnails in larger sized images, then here is a simple little tool you can use on any YouTube video. This works for custom thumbnails or auto generated thumbs in videos. Click here to download youtube thumbnails fast. It’s free and extremely easy to use. The only step you need to do is provide the video id from the YouTube URL. Just copy the video URL from YouTube and paste it directly into the thumbnail finder and the tool will search for the YouTube videos and share the image content with you. If you’d like to save the http img, just right click and click save in your browser. The best part is, it will try to find the largest version of the thumbnail images first, and then will try to find the next largest sizes. If the YouTube channel used large max resolution video thumbnails, then you will be able to see that image, as well as the smaller versions of the thumbnail if those were used in the YouTube video. Once you have access to view and add these images from any watch page online, you can make your own thumbnails better, using ideas you’ve gathered quick from these related images. You can use the maxresdefault size source images for example, to improve your recent video uploads with better thumbnail images that attract attention and get clicked. We aren’t in anyway associated with YouTube and you’ll want to review their posts and policy about using software to grab images from uploaded videos. This tool works even if you don’t have a user account and even if you have the https version of the YouTube service website URL. I’ve been following Jack for over 5 years now. Jack, I buy only your products and will keep buying them. You are honest guy that stands behind his products forever and ever. Nothing that you have produced has disappeared in time. It’s the opposite, everything you’ve created is relevant and up to date. Thanks so much Kal…and thanks for being a great customer too. Kal, can you check it now? I assume you are referring to the link above that goes to this page: http://marketbold.com/tubethumb/…it should be working now.